There are a bunch of North Shore municipal courses that are pretty decent. But this one, Winnetka, stands out above the rest I think. I’m pitting it against Wilmette, Glencoe, Highland Park, and Sunset Valley, and it edges those out. In fact, I’m going out on a limb here, Winnetka can compete for my golf dollars with high-end municipal courses like Village Links and George Dunne. It’s that great. I walked it for $49 a few Saturdays ago and it was even better than I remember. I haven’t played it since 2009 and I noted the addition of shaggy grass on many of the bunkers, which added a nice touch to an already beautiful golf course. It’s a good value with a lot going for it – great conditions, a solidly challenging middle tee box, and less than 20 miles from downtown. Also, if you want a real challenge, the 6,500 yard+ back tees provide a stern test because bunkers, trees, and lakes crowd almost every tee shot, lengthening this course even more. 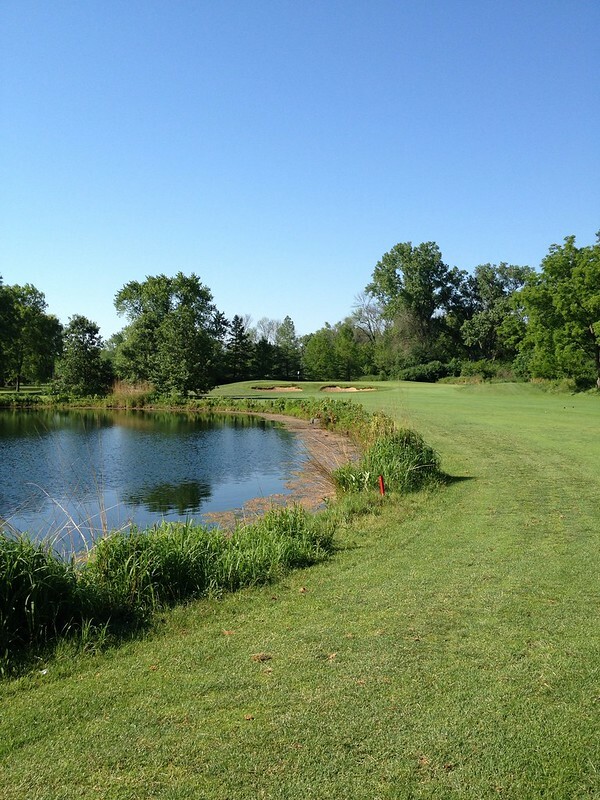 Pictured above is the approach to the beautiful, peaceful par four fourteenth hole. It’s short but there’s trouble: a lake left and OB/forest preserve right. The approach is exacting because the shallow, elevated green is guarded by two bunkers in front; don’t club down off the tee too much because you need to be sure you have a short iron approach. We shouldn’t be surprised that Winnetka has such a well-designed hole because some heavyweights have been involved with this course. They have a nice history on their website. The layout is short and tight, but it doesn’t really feel that short when you’re out there (tight for sure). Maybe it’s the par 71 or something. None of the par fives are going to beat you up, but the par fours and par threes have a ton of challenge. Even the middle tees have three par fours over 400 yards, and the par threes are nicely varied. As the round progresses the par threes get longer and longer, measuring from the middle tees: 147 yards, 164 yards, 171 yards, and 207 yards. I went 7 iron, 5 iron, 4 iron, and 4+ wood on this day. Nice variety. They seem to have thrown in the women’s tee as an afterthought. It’s a brutal 5,569 yards long and will probably frustrate many a female with it’s 73.7/131 rating/slope combination. I’ll give you another great thing about this course: they have crack of dawn tee times. We went out at 6:04am because that’s the earliest one I could get. There were plenty of groups already out. I love the early, early tee times that many of the courses here in Chicago let you take. This eastern edge of the central time zone is great for morning people like myself. Chicago is the best everyday golf region on earth! Posted in golf on 2012/07/01 by John.